As a homeowner in south Texas, it can be easy to overlook the need to prepare for cold weather during the winter months. It’s hard to believe that people here actually think about winterizing at all, especially when AC units are humming most of the year. But, every now and then, we do experience freezing temperatures and more often than not, homeowners forget to protect their pipes. Ideally, you should winterize your pipes in the fall, before winter sets in. However, if you’ve forgotten to take care of your pipes and all of a sudden you’re in the middle of a deep freeze, you can still prevent disaster. Running water through a pipe, even at a trickle, helps prevent it from freezing. If you are experiencing freezing temperatures and they are expected to last for a few days, turn on your faucets and let the cold water drip, both inside and outside, to keep water flowing through your pipes and slow down the freezing process. Anywhere cold air blows on a pipe, it creates the potential for freezing. During a freeze, open kitchen and bathroom cabinet doors to allow warmer air to circulate around the plumbing and help prevent the exposed pipes from freezing. If your bathroom or laundry room is located above or next to a garage, it can be particularly vulnerable, so keep the garage door closed to maintain maximum heat. Take preventative measures and wrap outdoor pipes, especially those that could be exposed to severe cold, like outdoor hose bibs, swimming pool supply lines and the backflow preventer for the sprinkler lines. Each winter, wrap the backflow preventer with old towels and newspaper and then use duct tape to secure a plastic bag around it. Typically in this area in the winter months, sprinkler systems are rarely exposed to freezing temperatures. However, a broken sprinkler pipe due to freezing can lead to damage to the delicate components that make up the entire system, and increase your cost of repair. Before the onset of winter, turn off your sprinkler system and drain the lines. To make sure the system is totally drained, it’s best to call an irrigation company to blow out any water left behind in the underground lines. Drain, disconnect and store garden hoses. If your home has a separate shut-off for external faucets, turn it off and drain the water from those faucets. It’s good to know where your main waterline shut-off is before problems arise. Depending on the age of your house, it can be inside a garage, basement or laundry room, or underground in your yard. 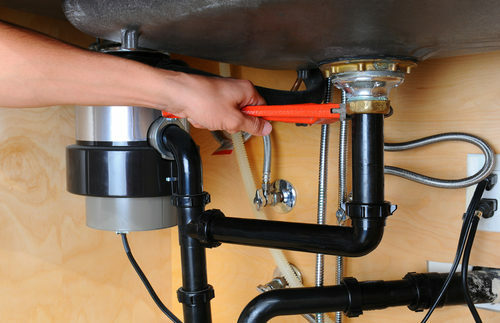 After turning the water off, turn on faucets to allow the water to drain and release the pressure in your pipes. Finally, never turn off the heat when you leave home during the winter. Instead, set the temperature to at least 55 degrees F and, if you have multiple heat zones throughout your home, be sure to adjust all thermostats appropriately.